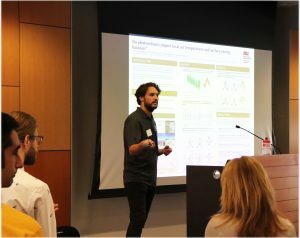 1st Place in the Postdoctoral Researcher category – Ashley Broadbent (SGSUP), poster title: Do Photovoltaics Impact Local Air Temperature and Surface Energy Balance? 3rd Place in Graduate Student Category – Saud AlKhaled (TDS), poster title: Between Aspiration and Actuality: A Systematic Review of Urban Heat Mitigation Strategies in Hot Urban Deserts. A unique component to this poster event was the opportunity to have several presenters participate by Skype. 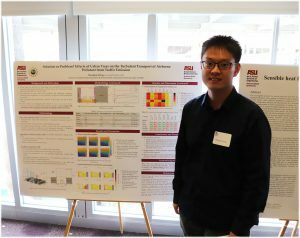 This gave ASU participants the opportunity to interact with students from around the country who are engaged in urban climate collaborations with ASU researchers. ← Qunshan Zhao wins Nystrom Award! is a partnership between the College of Liberal Arts and Sciences , the School of Geographical Sciences and Urban Planning, and the Julie Ann Wrigley Global Institute of Sustainability .